The past two years have seen Dean Baquet become the first black executive editor of The New York Times and Lester Holt become the first black solo anchor of a weeknight network news program. But minorities are still underrepresented at U.S. news organizations, especially when it comes to the places that would-be journalists traditionally try to break into the business: smaller local TV and newspaper outlets. Although minorities (including black, Hispanic, Asian American, Native American and multiracial populations) make up over a third of the U.S. adult population (35%), they make up only 22% of the local television news workforce, according to a study by the Radio Television Digital News Association. The figure is even lower for daily newspapers, where only 13% of newsroom employees are minorities, according to an annual survey of newsroom employment by the American Society of News Editors (ASNE). These figures have changed little over the past two decades. One factor behind the figures in these two studies is what happens at the hiring stage for those seeking to enter the news business. A recent analysis by Alex T. Williams pointed to data showing that minorities who received undergraduate journalism or communications degrees and specialized in print journalism were 17 percentage points less likely than non-minorities to find a full-time position within a year of graduating; the same held true for graduates specializing in broadcasting. Traditionally, journalists have begun their careers at smaller organizations rather than large-market newspapers and TV stations. 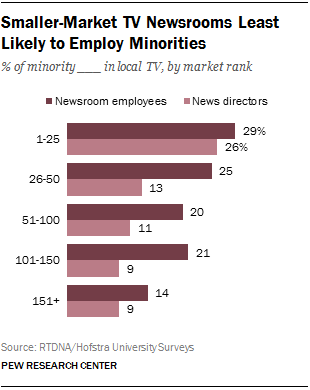 But for both local TV and newspapers, it’s the small outlets that are least likely to have minority employees. Low-circulation newspapers are the least likely to hire minorities for their first full-time professional jobs, and small-market local TV stations are the least likely to promote them into news director positions. At high-circulation daily newspapers, minorities make up about one-in-five newsroom workers. But that figure falls to less than 10% at lower-circulation dailies. For instance, only 6% of employees at daily papers with circulations of 5,000 or less are minorities. As with the overall percentage of minority employees at daily newspapers, this has been consistent over time. In 2004, for example, minorities made up 19% of the workforce at newspapers with circulations of over half a million and less than 10% of the workforce at newspapers with circulations of under 50,000. Smaller daily newspapers are also less likely to hire minorities for their first job as a full-time professional journalist. At newspapers with circulations of 500,000 or more, 43% of those hired for their first professional journalism job are minorities. At those with circulations of 5,000 or less, however, only 12% of first-time hires are minorities. Budget cuts at daily newspapers also seem to be hitting minority employees harder. Nearly one-in-four minority employees at dailies (22%) left or lost their jobs in 2014, the largest level of minority job loss since ASNE began gathering data in 1984. Of white employees, 14% left their organizations in 2014. What these data do not address are the reasons why this disparity exists. Smaller news organizations may differ from large ones in a number of ways: the size and demographics of the audience they serve, what resources they have available to recruit employees, and the overall size of their workforce, among other factors. Nevertheless, the divide in minority employment is clear and consistent across both daily newspapers and local TV.